In How I Edited an Agricultural Paper by Mark Twain we have the theme of inexperience, anger, ignorance, pride, confidence, responsibility and concern. Taken from his The Complete Short Stories collection the story is narrated in the first person by an unnamed narrator and from the beginning of the story it becomes clear to the reader that Twain may be exploring the theme of inexperience. The narrator has never edited an Agricultural paper before. Something that is noticeable by the reaction of those in the town. They are anger at the narrator’s efforts. It also appears to be a case that the narrator only took the job as an editor because of the salary which may suggest that money is the narrator’s driving factor when it comes to editing the paper. It is clear that he does not know anything about agriculture (turnips growing on trees) and if anything he is ignorant of agricultural methods and practices. Something that is noticeable by the second man coming to the narrator’s lodgings. The editor’s reaction to the narrator is also interesting as he is genuinely concerned about what will happen the paper. Which is very natural considering that the paper provides the editor with a livelihood. The editor also believes in truth. That each article written in the paper should be based on some sort of truth. Which is not the case when it comes to the narrator’s writing. The editor himself is an interesting character as he speaks passionately about the paper while the narrator is prepared to write the first thing that comes to his mind and which is factually wrong. If anything the editor takes pride in his job while the narrator again only appears to be working at the paper because of the salary he was offered. It is also noticeable that what is written in the paper is taken so serious by the readership that the paper takes on biblical proportions. What is written is to be believed. Something that is lost on the narrator. The readership of the paper appear to be agricultural based people and the narrator hasn’t got a clue about anything that he has written. Accuracy does not appear to be a driving factor when it comes to the narrator’s writing. It is also noticeable that the narrator takes pride in what he has written. As though whether or not he may be deluded is left to each individual reader to decide. Though others don’t believe a word of what the narrator has written for the narrator the words still ring true for him. The narrator appears to enjoy writing but at the same time is avoiding what is true and what isn’t true. Twain is also using the ridiculous to emphasis the ineptitude or incompetence of the narrator. Something that is noticeable by the fact that the narrator has written that turnips grow on trees. It is also noticeable that those who read the paper take every word in the paper seriously. If the narrator had written his articles with the intention of making the readership laugh he has failed. The readership are farmers who rely on the articles in the paper and expect them to be serious. What is also interesting about the story is that the narrator does not believe that he has done anything wrong. 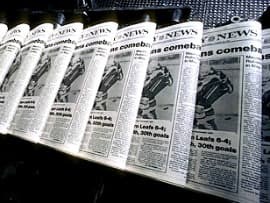 When speaking to the editor of the newspaper the narrator tells him that others have written articles in other newspapers and not known anything about what they have written. Knowledge of a subject is not important to the narrator. He appears to be more concerned about his style of writing rather than the quality of the content. Which again goes against what the readership of the paper are looking for. Everything that the narrator has written during his time at the newspaper is of no benefit to the readership of the paper. The end of the story is also interesting as the narrator, after the editor has spoken to him, resigns from the paper. This may be important as the narrator was most likely going to be fired by the editor due to the outrage of the readership of the paper. While the narrator has viewed his time at the newspaper as no different to any other job he has held, the editor of the paper knows fully that the narrator is not qualified to write editorials on agricultural matters. It is also interesting that at no stage in the story is the confidence of the narrator shaken. When the old man is talking to him, he remains calm even though he has made errors in his writing. Similarly when the angry man comes into the narrator’s lodgings, rather than being afraid the narrator again remains calm. Not even the editor’s angry can shake the narrator’s confidence and there is a sense that the narrator believes that the editor was lucky to have him working at the newspaper. At no stage does the narrator take any responsibility for his actions nor does he look inwards to see if maybe he has been wrong. For the narrator the fault lies with others. McManus, Dermot. "How I Edited an Agricultural Paper by Mark Twain." The Sitting Bee. The Sitting Bee, 6 Aug. 2017. Web.